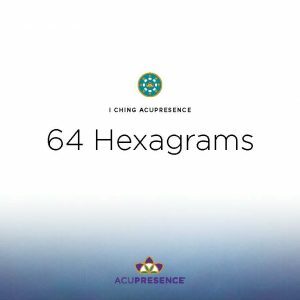 Finding your acupoints can be a challenging aspect of AcuPresence. It may seem complicated but it does not need to be. Locate an acupoint by gently sliding the tip of your forefinger on your skin, along the meridian line. Often, yet not always, there is a slight indentation or tenderness at the site of the acupoint. Or you will feel it energetically. It might even be located in a slightly different spot on your body than described. As long as you’re in close proximity, even off by ½ inch or so, it’s fine. Trust your senses, your intuition, and your body’s wisdom. Locating acupoints is done by using the Anatomical Chinese Inch, or ACI. Since everyone’s body is different, this system uses each person’s inborn measurements to make finding acupoints easy. The following options utilize your fingers as a measuring tool. The second method for measuring ACI’s is to create your own measuring tape or ruler that is unique to your anatomy. This is done by taking a piece of thick paper or cardstock and folding it to measure about 1 and 1/2 inches wide by about 5 inches in length. Next, you will place your thumb on it and mark the width with a small line. Continue to mark 4 thumb widths and number them. Additional resources for locating acupoints are available at AcuPresence.co. 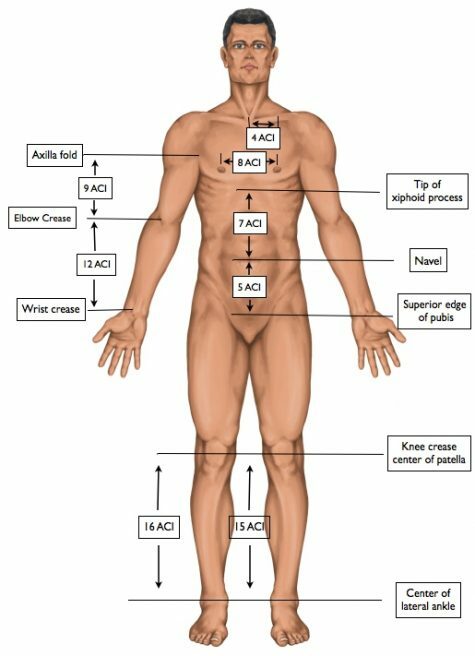 This figure is an anatomical map showing ACI measurements between landmarks of the body. You may use this map to bring clarity and ease to your acupoint location experience. Each Acupoint Synopsis Page contains a picture as well as written directions for locating an acupoint. The written description refers to specific body landmarks to measure from. If you aren’t sure what or where that body part is, you can find it on this map. For example, certain acupoints on the chest are found by measuring from “below the clavicle,” meaning the hollow space below the collarbone. Some acupoints on the lower leg are found my measuring from the “prominence of the ankle.” Others refer to the “wrist crease” or “knee crease.” These terms are labeled on this map to make locating points easy.